Never show more than one active editor. Allow multiple editors at the same time. Always save the current edit value when closing. Do not allow user to initiate editing. Edit an item when clicked. Edit an item when double clicked. Edit a selected item that is clicked again. Scrolls minimally to make it visible. Positions the item at the top of the viewport. Positions the item at the bottom of the viewport. Positions the item at the center of the viewport. Returns the horizontal header alignment for a column (deprecated). To display a model with many columns, this option allows you to keep the first column fixed while scrolling through the other columns of the model. The default value is Wt::AlignLeft. This method has no effect. The border color should be set using CSS. The default alignemnt is horizontally left, and vertically centered. (Wt::AlignLeft | Wt::AlignMiddle). Valid options for horizontal alignment are Wt::AlignLeft, Wt::AlignCenter or Wt::AlignRight. Valid options for vertical alignment are Wt::AlignMiddle or Wt::AlignTop. In the latter case, other contents may be added below the label in createExtraHeaderWidget(). Sets the header height, and vertical alignment (deprecated). By default, the header text is a single line that is centered vertically. Along with setting the header height, this also configures vertical aligment and header label word wrapping. 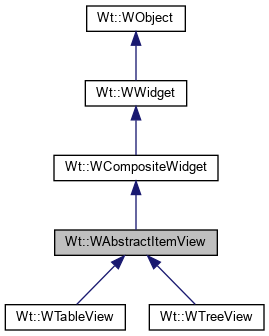 This has been deprecated in favour of the more fine grained control using setHeaderAlignment() and setHeaderWordWrap(). When multiLine is false, the header alignment is set to Wt::AlignMiddle. When multiLine is true, the header alignment is set to Wt::AlignTop and header word wrap is set to true. use setHeaderHeight(), setHeaderAlignment() and setHeaderWordWrap() instead. The object name can be used to easily identify a type of object in the DOM, and does not need to be unique. It will usually reflect the widget type or role. The object name is prepended to the auto-generated object id(). The default object name is empty. Only letters ([A-Za-z]), digits ([0-9]), hyphens ("-"), underscores ("_"), colons (":"), and periods (".") are allowed in the id.